Bill was short of money and was out looking for a job. Pastor Nelson offered Bill $500 to buy paint and paint the church. Well, Bill went out bought some paint and started painting the church. He discovered that he was using more paint than he expected so the added some thinner to the paint, well it is still covered but not as well as it did at first. Well he still was using more paint than he wanted to use so he added still more thinner to the paint. The paint was too thin cover well, but Bill still kept on painting. This entry was posted in Bad Pun Wednesday on May 24, 2017 by epjenkins. Friends, I try not to get too serious on this blog. I try to have fun, maybe make you laugh or at least crack a smile. A woman named Eva Hicks was shopping at a Wal-Mart in Centerton, Arkansas. That is in the Northwest part of the state. She asked a lady to please move so she could get by and the old bat went off on her and another lady who commented on her behavior. I’ll not repeat it all here, you can watch the video. 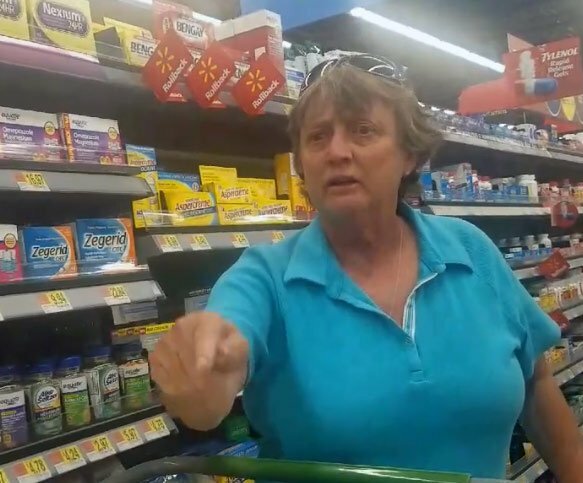 Spoiler alert: Jerkface McRacist (I don’t know her real name, but this fits) gets invited the leave by the management of Wal-Mart. I’m guessing Jerkface McRacist is not a smart, educated woman. I bet you a trip to Branson (with Bald Knobbers tickets) that the only 100 percent this woman ever got on a test involved her peeing on a stick. I want people to know, we are all not like this in Arkansas. Most people I know are good, decent folks. And I am tired of the few folks who make us look like racist, stupid hicks by being…racist, stupid hicks. Think and ponder for a moment about what you are going to say. Then just shut-up. If I don’t like you, I am judging you because you are a jerk and not because of the color of your skin or what country your ancestors came from. Ok, I’ll also judge you for what music you listen to, wearing male rompers, and not liking dogs. If you are a good person, you are golden with me. Someone knows her. Make her famous folks. Show the video to your kids as an example of how NOT to act. This entry was posted in Almost True. Sorta. on May 24, 2017 by epjenkins. Welcome to episode 4. We’re gonna talk Wal-Mart and the folks in there that make it looks like the bar scene from Star Wars. Also, the sad story of little Bojangles. This entry was posted in Podcast on May 9, 2017 by epjenkins. This entry was posted in Podcast on May 6, 2017 by epjenkins. This entry was posted in Podcast on May 3, 2017 by epjenkins. This entry was posted in Podcast on April 28, 2017 by epjenkins. This entry was posted in Podcast on April 25, 2017 by epjenkins. A fellow received a mouse for his birthday and he loved it so much that he never parted with it. He took this mouse everywhere, to work, to parties, to the opera… One day, a good friend of his died and so he went to pay his respects. Naturally, he took the mouse, which was perched on his shoulder. On his way home, he suddenly realized that the mouse was gone! He retraced all his moves for the day and realized that the last place he had seen the mouse was at the funeral. He raced back across town, but it was too late. The mouse must have jumped off his shoulder while he was sitting in the hearse. He spoke to the funeral directors, but they couldn’t find it: it had completely vanished. The man was filled with grief as he remembered an old adage his mother had told him time and time again as a kid: Never lock a gift mouse in the hearse. This entry was posted in Bad Pun Wednesday on April 6, 2016 by epjenkins. William Penn, the founder and mayor of Philadelphia, had two aunts – Hattie and Sophia – who were skilled in the baking arts. One day, “Big Bill” was petitioned by the citizens of his town because the three bakeries in the town had, during the Revolution, raised the price of pies to the point that only the rich could afford them. In fact, even to this very day, their acheivements are remembered as the remarkable Pie rates of Penn’s aunts. This entry was posted in Bad Pun Wednesday on March 22, 2016 by epjenkins.